Do you live in Whitehawk? Do you have memories of St. Cuthbert’s Church, Manor Road Gym and other places in the area? Please join us for a morning of sharing memories. 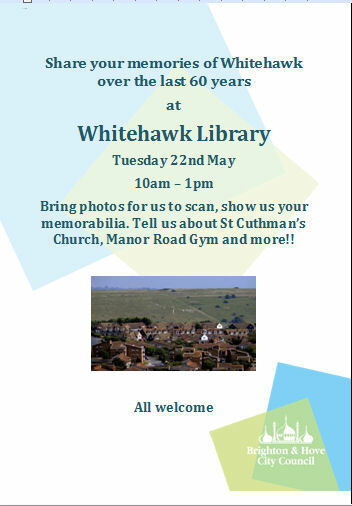 Dear Wendy and anyone interested in the history of Whitehawk. Fred Netley’s excellent book tells stories of the area from the 1930’s to the mid 1970’s , so I think it would be good to bring things up to date and hear from people who have grown up and lived in the area in the past 40 years . I’d love to hear how things went at this event in 2012.